We have yet ANOTHER amazing beer hitting our taps soon! 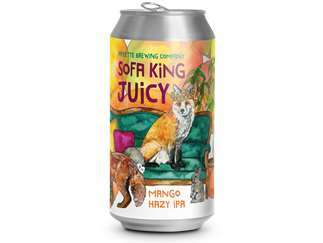 Sofa King Juicy is a bright, fruit-forward, Hazy-IPA brewed with Vic Secret, Mosaic and Citra Hops for a luscious tropical-fruit and citrus aroma and flavor. We fermented this small-batch IPA with over more than 500 pounds of Mango puree to enhance the tangy and sticky-sweet flavor of tropical fruit. This Hazy IPA pours an inviting bright-gold luster with a dense, brilliant-white foam-stand. At 7% ABV and just 11 IBU, Sofa King Juicy is a hearty, full-bodied Hazy-IPA ready for your next adventure. Hitting our taps and shelves in 16oz four-packs Friday, March 29th! This incredible brew is going to go fast so come in a and get it while you can!